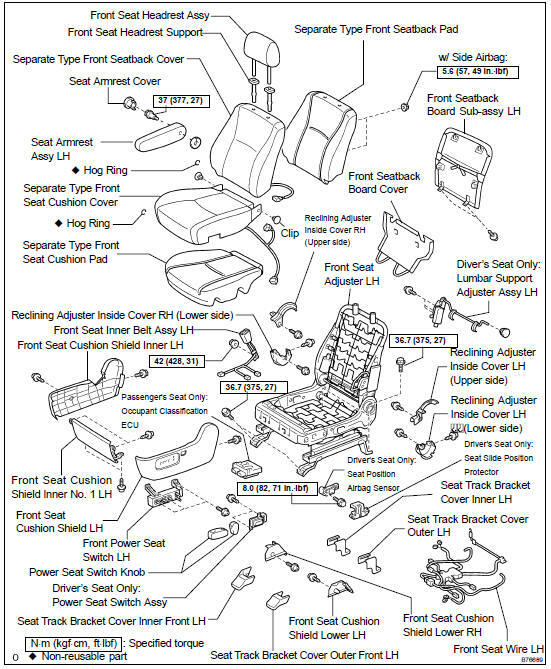 Wear safety gloves, because the cutting surfaces of the seatback frame and seat adjuster may injure your hand. Work must be started at least 90 seconds after the ignition switch is turned to the LOCK position and the negative (-) terminal cable is disconnected from the battery. (a) Using a screwdriver, disengage the 3 claws and remove the bracket cover. (a) Remove the 2 rubber bands from the back of the front seatback board cover. (b) Using a screwdriver, pry out the 2 power seat switch knobs. (c) Remove the 7 screws. (d) Using a screwdriver, disengage the 4 claws and clip, and remove the cushion shield together with the cushion shield inner and cushion shield inner No. 1. (e) Disconnect the connector of the power seat switch. (f) Remove the screw and disengage the claw using a screwdriver to remove the cushion shield from the cushion shield inner No. 1. (b) Using a screwdriver, disengage the claw and remove the cushion shield inner from the cushion shield inner No. 1. (b) Remove the 3 screws and seat switch. (a) Remove the 2 screws and seat switch. (a) Using a clip remover, remove the 2 clips on the cushion cover side. (b) w/ Seat heater: Disconnect the seat heater connectors. (c) Disengage the hook and remove the hog rings and seat cushion cover together with the pad. (d) Remove the hog rings and cushion cover. (b) Remove the 2 screws and lumbar support adjuster. (a) Remove the screw and reclining adjuster cover. (a) Remove the 2 screws and reclining adjuster cover. HINT: Be sure to maintain a clearance between the seat position airbag sensor and the seat rail is within 0.6 mm (0.023 in.) to 2.0 mm (0.079 in.). (d) Install the seat slide position protector. (e) Connect the wire harness connector. (g) Connect the negative battery's terminal. Adjust the seat position according to the conditions below. NOTICE: Do not place any objects on the seat. Perform the initialization by attaching a mass more than 2 kgs in the seatback pocket, seatback table installed by the user or other appropriate location.